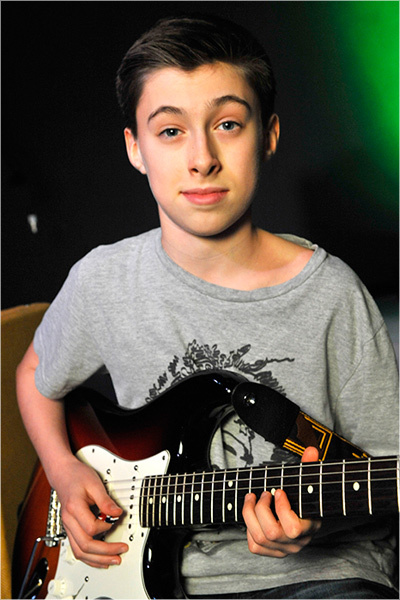 " Caspian Coberly is a 13 year-old guitar player, songwriter and singer. 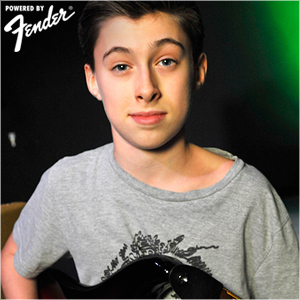 Obsessed with the guitar-specifically Fender Stratocasters- since he was a baby... "
Caspian Coberly is a 13 year-old guitar player, songwriter and singer. Obsessed with the guitar-specifically Fender Stratocasters- since he was a baby, he was quickly caught up in the musical world of Jimi Hendrix, Bob Marley, Albert King, Eddie Hazel and Funkadelic, and Buddy Guy, and Jeff Beck, amongst others. At age 5, Caspian began studying with Jay Roberts, son of jazz legend Howard Roberts. By age 6, he began performing. And at 7 years old, Caspian started writing songs, drawing on his exposure to funk, metal, and rhythm and blues. By 8, he was performing his original music, as well as performing for audiences of up to 17,000 at Seattle’s Key Arena, playing the National Anthem for professional and college sporting events. While performing original music at a wine bar in Seattle, Gigi White, wife of legendary YES and John Lennon drummer Alan White, approached Caspian about playing a show at a charity event she was holding. What followed was a mentorship from Alan and Gigi. Alan and Caspian have performed several times together and Alan is the first person to offer Caspian advice as he navigates the intricacies of the musical world. Subsequently, Caspian has opened for Buddy Guy, Robert Randolph, Duff Mc Kagan and his band Walking Papers, Randy Hansen, Mike McCready (Pearl Jam), and Jerry Cantrell of Alice in Chains. He has been honored to share the stage with Michael Shrieve of Santana, War’s harp master, Lee Oskar, UK Blues sensation Davey Knowles, Rock and Roll Hall of Famers Roger Fisher, Steve Fossen, and Michale Derosier of Heart. He has guested with Grammy winners Blues Traveler, most recently at Colorado’s famed Red Rocks on the 4th of July. Caspian was also asked to perform at iconic Ventures guitarist Don Wilson’s 80th birthday party at the Hard Rock Cafe in Seattle.